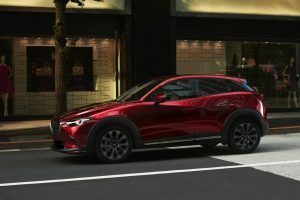 For 2019, The Mazda CX-3 subcompact-sized Crossover continues to impress. New for the model year is some standardization across the range with Mazda’s innovative G-Vectoring Control system, to help with cornering and stability on all models. A revised suspension system with reworked bushings and dampers has tightened up steering, and measures such as thicker glass, and more sound insulation have improved noise, vibration and harshness isolation. Note, the entry GX model comes in at an amazingly attractive price of only $19,995 with a six speed manual transmission, remote entry locking, push button start and electric windows. We tested a top-tier GT model that for 2018 arrives with as standard: revised color head-up display, power-adjustable driver’s seat with lumbar support and memory settings, a heated steering wheel, and traffic-sign recognition. The engine choice remains the same, a fuel efficient 2.0-litre Mazda SKYACTIV four-cylinder engine developing 146 horsepower, and 146 pound-feet of torque, the gearbox is as six speed automatic transmission with FWD or All-wheel drive. There is space for four in this vehicle, however it is a tight fit for five tall adults. The rear bench seat is cozy and features a 60:40 splitting folding back seat. With the rear seat folded, there is 1,484 litres of cargo space in the CX-3 and a rear cargo cover. On the road, the CX-3 six-speed automatic transmission, delivers power to all four wheels via Mazda’s i-Activ intelligent on-demand all-wheel-drive system. Acceleration is good on highways, the SKYACTIVE engines light weight, advanced engineering coupled with a well geared transmission means the CX-3 feels willing all the time. Yes additional power would be nice for more top end torque, but nothing major here in term of everyday driving. The CX-3’s sport driving experience is enhanced by the Mazda’s G-Vectoring Control system, which reduces engine torque, and adjusts steering and throttle inputs to add slight weight on the front wheels to make the steering feel firmer and more direct. It is a very effective system that works well, giving the XC-3 the driving dynamics of a zippy or should that be “zoom zoomy”sports car! Where the CX-3 shines is in the handling and ride comfort. The new suspension, chassis and NVH suppression have also noticeably improved the on road dynamics. Highly attractive with much to commend it, the CX-3 is ideal for its packaging and performance. Highly recommended. 2019 Mazda CX-3 GT AWD. Base MRSP $27.995. With options, Freight and PDE. Price as tested: $33,190.